"I've got to say it's been a long time coming," said Hartley, who's lived in the neighbourhood for 38 years  her parents moved to Killarney 60 years ago. Federal Minister of Defence Harjit Singh Sajjan, also a longtime resident of the neighbourhood opened the ceremony outside the gynmasium of the Killarney Community Centre, January 9. 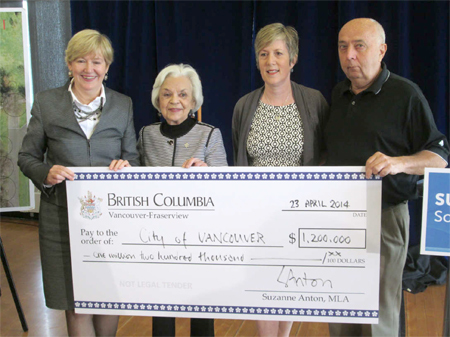 Agreement reached for Southeast Vancouver seniors! Left to right: Lorna Gibbs, SVSACS president; Beatrice Ho; Mabel Leung; Ramesh Kalia; Hon. Suzanne Anton, MLA; George Grant, SVSACS secretary; and MP Wai Young. SVSACS display booth, Champlain Heights Community Centre Summer Fair, June 6, 2015. 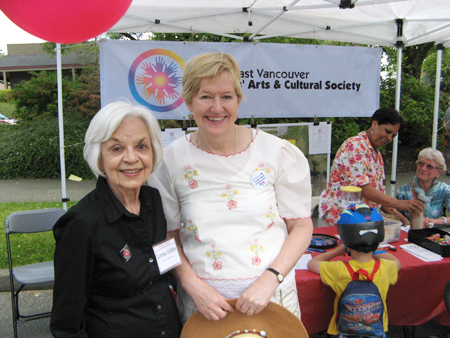 Lorna Gibbs and the Honorable Suzanne Anton at the SVSACS display booth, Champlain Heights Community Centre Summer Fair, June 7, 2014. 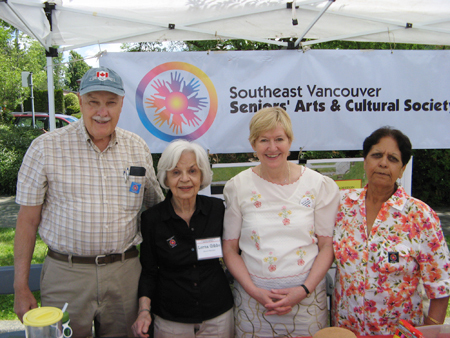 Left to right: George Grant, Lorna Gibbs, the Honorable Suzanne Anton and Ramesh Kalia at the SVSACS display booth, Champlain Heights Community Centre Summer Fair, June 7, 2014. On April 23, the Hon. Suzanne Anton, MLA for Vancouver-Fraseview announced a further $1.2M for a seniors centre in Killarney, increasing the province's contribution to $2.5 million. 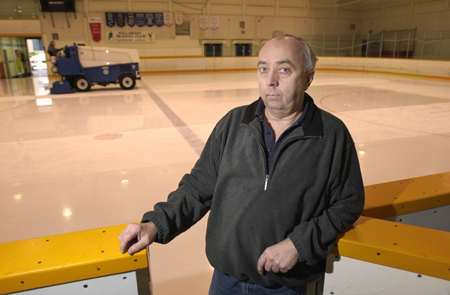 Nearly 100 people  many of them seniors  attended the event at Killarney Community Centre. 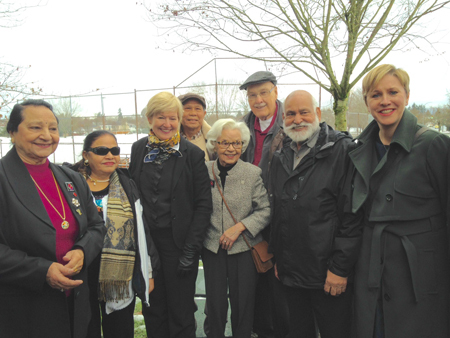 Fraserview community gets its seniors centre! 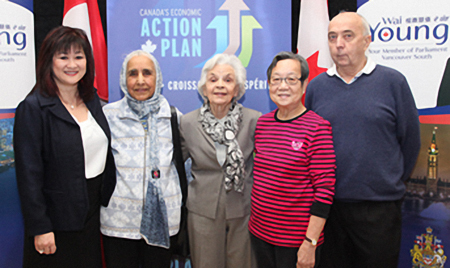 MP Wai Young with community and seniors advocates Ms. Mohinder Sidhu, Ms. Lorna Gibbs, Mrs. Shin Wan Hon, and Mr. Keith Jacobs. B.C. 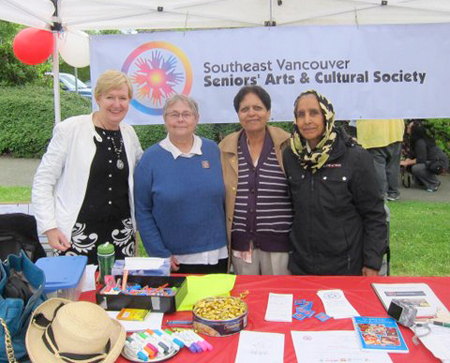 Minister of Justice Suzanne Anton visits with Southeast Vancouver Seniors Arts & Cultural Centre members who are soliciting donations and providing information to seniors. Left to right: Hon. Suzanne Anton, Pat Deibert (director), Ramesh Kalia, Mohinder Sidhu (director). Community Achievement Awards presented to volunteers by MP Wai Young, December 14, 2012. SVSACS recipients include Nelson Didulo, Lorna Gibbs, George Grant, Ramesh Kalia, Bert Massiah, Kamlesh Sethi and Mohinder Sidhu. 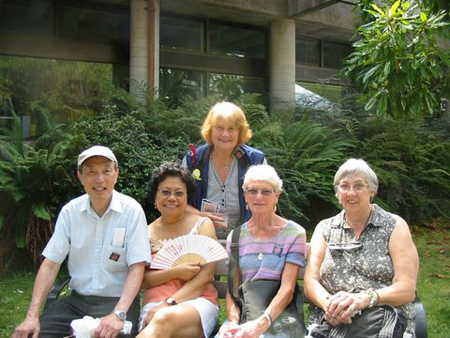 SVSACS Members at Kensington Community Centre Barbeque hosted by Mable Elmore, MLA on August 18th. Good time had by all. MP Wai Young's New Year Celebration Year of the Dragon, February 2012. George Andersen, Friend, MP Wai Young, Gail McKay, Lorna Gibbs, Keith Jacobson. 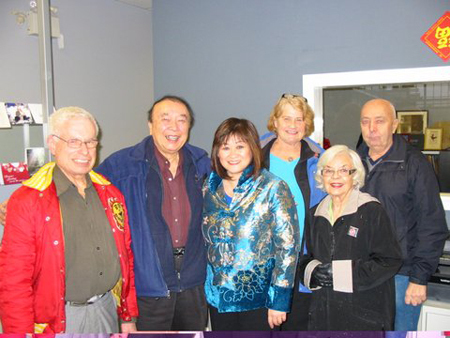 Vancouver-Fraserview MLA Kash Heed is working to get a new seniors centre up and running for his community. Please send your letters of support. On July 4th, Wai Young, M.P. for Vancouver East introduced Hon. 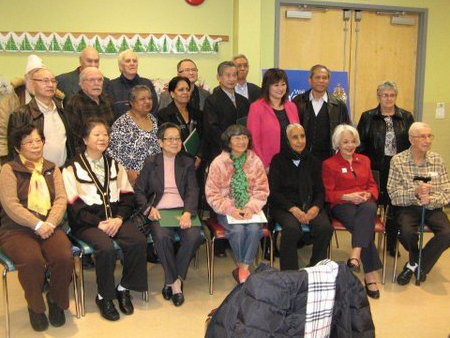 Alice Wong, Minister of State for Seniors to a few of the members of the Southeast Vancouver Seniors Arts & Cultural Centre Society and Killarney Seniors Society. The Meeting was to discuss funding for the much needed Centre for older adults to be built on land provided by Vancouver Parks & Recreation. M.P. Wai Young presented Minister Wong with more than 7,000 signatures on a petition pleading for a dedicated seniors centre. On July 4th, Wai Young, M.P. for Vancouver East introduced Hon. 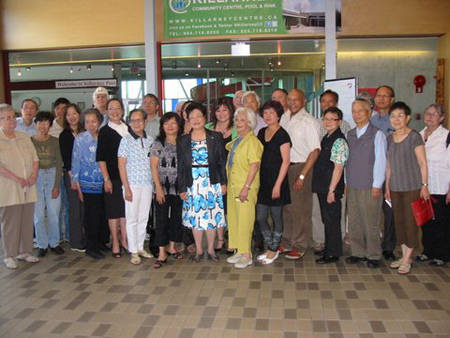 Alice Wong, Minister of State for Seniors to a few of the members of SVSACS. Letters to Members of Parliament can be sent postage-free through Canada Post. Please send your letters of support. 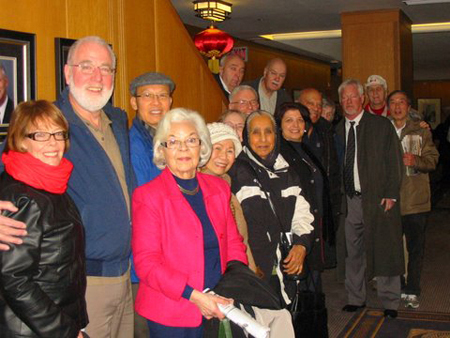 SVSACS at City Hall, February 1, celebrating Council's motion to allocate $2.5 million and reaffirm their commitment to provide the land for a seniors centre in Southeast Vancouver. We are now look forward to announcements from the provincial and federal governments. The Vancouver Park Board contracted City Spaces (with assistance from a steering committee) to study the feasibility of building a new (10,000 square-foot) wing for seniors onto the Killarney Community Centre. 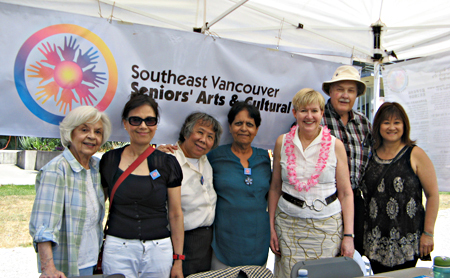 the researchers consulted with organizations in southeast Vancouver that provide seniors' services and seniors' programmers at community centres, and identified the following needs: a large-capacity, multi-purpose space; a kitchen to provide meal programs; additional space for classes such as language courses; and a seniors' lounge. 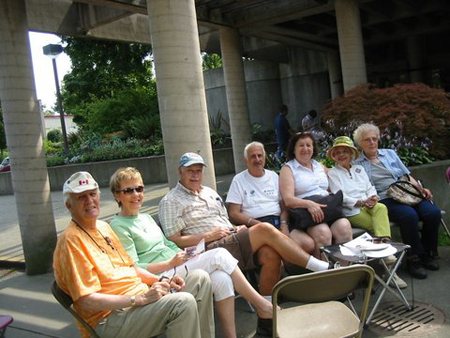 Recent News coverage about a seniors' centre for southeast Vancouver. Donate to SVSACS with PayPal!